There are ways to help ease the pain and prepare us for this process. Here are some great books recommended for children who lose a family dog. If you have others, please comment below. In this joyfully imagined place, God is a smiling, white-haired gentleman who watches the goings-on as dogs run and bark, play with kids, eat dog biscuits in cat shapes, and sleep on fluffy clouds. It’s also a place where dogs patiently wait for old friends: “They will be there at the door. Angel dogs.” Rylant’s kindergarten concept of the hereafter is cheerful but not humorous or glib. A book for parent-child sharing and discussion. From Booklist (Stephanie Zvirin). This is a wonderful book about healing and bonding. It is the story of a young boy and his dog Elfie. When Elfie gets old and dies the boy sadly buries Elfie after openly sharing his grief. He vows that he will tell every pet he ever has that he will always love him. The book helps young children understand death and provides a valuable lesson that it is always good to tell a loved one, human or pet, that you will always love them. A light, magical little book that honors the timeless connection between people and their canine companions. Written from the heart after the unexpected loss of her “forever dog” Martha, this charming book will bring comfort to anyone who has ever had to say goodbye to their best four-legged friend. For Every Dog An Angel is also a heart-felt way to welcome a new puppy or to celebrate a much-loved doggie friend. Offered are suggestions for healing activities that can help survivors learn to express their grief and mourn naturally and age-appropriate activities that teach younger people that their thoughts are not only normal but necessary. Acknowledging that death is a painful, ongoing part of life, they explain how people need to slow down, turn inward, embrace their feelings of loss, and seek and accept support when a loved one dies. Great idea to post these books. I was looking for books to help my 4 year old son deal with our dog’s journey with bone cancer. Since we don’t know how long Xanadu will be with us, we talk a lot about what our life will be like when he dies. A friend from the Bone Cancer Dogs Yahoo Group recommended a book, “Give Your Dog Heart” Love Will Come Your Way by Dr. Aubrey Fine. 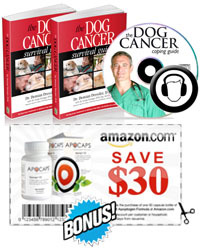 It is just out so not yet on Amazon but can be ordered at http://www.healingpawspress.com. I am waiting for it to arrive. Best to you and your girls! Give a Dog Your Heart is an uplifting story about a boy named Corey and his best childhood friend named Hart. Their friendship spans over a decade and ends with Corey learning one of the hardest lessons in his young life: coping and understanding death. Give a Dog Your Heart allows children to hear Coreys story and learn how he dealt with his loss. The book provides children with a passionate story of love and hope and a message of how they can always cherish their loving relationship. Give a Dog Your Heart is simply written and will help children and their families begin to talk about their feelings about loss. They will leave reading this story realizing that when you give a dog your heart, love will always come your way. Such a beautiful book; doesn’t sugar coat anything but explains what a lifetime is and how the length of a lifetime will vary depending on the species and what happens to the individual. Can’t recommend highly enough. Oh, btw, the author of Dog Heaven (Cynthia Rylant), which we haven’t read yet but will, is the woman who wrote the popular and wonderful Henry and Mudge books (and Annie and Snowball books) about a boy and his Big Dog Mudge (a mastiff, I’m guessing). We also have the book mentioned above “For every dog an angel” and it is lovely. There’s a companion book, “For every cat an angel” and another book called Shelter Dog by the same woman, all recommended. Thanks for the feedback Beth, it’s really helpful. Many hugs coming your way.